I saw this writing exercise that uses a list format and couldn’t resist thinking what would I choose for each topic. I wish Mom were here so I could have her fill it out too. Think about what answers you would put. I challenge you to give this some thought and to write about it. Here are my answers below. A month. I’d be October. The crisp leaves crunch under my feet, the sweltering days of summer are past and pumpkins accent the porches. A country. I’d be Ireland. Land of my ancestors, Celtic music, and everyone’s a storyteller. A time of day. I’d be noon time. I love a leisurely lunch. A sea animal. My choice is a dolphin. So sleek, so intelligent. A direction. I’d be west. My ancestors traveled west to settle in Kansas. A liquid. I’d be a margarita. So refreshing with a little salt around the rim. A gemstone. I’d be a pearl. A tree. I’d be a redbud. they give a burst of color in the spring. A game. I’d be Bookworm. Delighting in creating new words. A famous painting. I’d be Van Gogh’s Sunflower. That fits my Kansas heritage. A flower. I’d be an iris. So regal, so welcome in spring. A kind of weather. I’d be a gentle rain refreshing the thirsty flowers. A musical instrument. I’d be a fiddle. So lively, so lovely, playing Irish tunes. A piece of furniture. I’d be a comfy reading chair. A color. I’d be aqua, like the sea in tropical islands. A means of transportation. I’d be a cruise ship filled with happy people on vacation. An emotion. I’d be reflective. Thinking about the past, present and the future. A fruit. I’d be a pear. A sound. I’d be a purr. A vehicle. I’d be a golf cart. A place. I’d be a library filled with books and open 24 hours a day. A scent. I’d be the scent of orange blossoms. An animal. I’d be a wombat. Once I held one in Tasmania. A random object. I’d be a book, of course. A body part. I’d be hands. So useful. An item of clothing. I’d be a flowing caftan, comfortable and casual. Now, it’s your turn. Write down the list and add your own answers. Gail Lee Martin’s sister has had some awesome cats over the years. 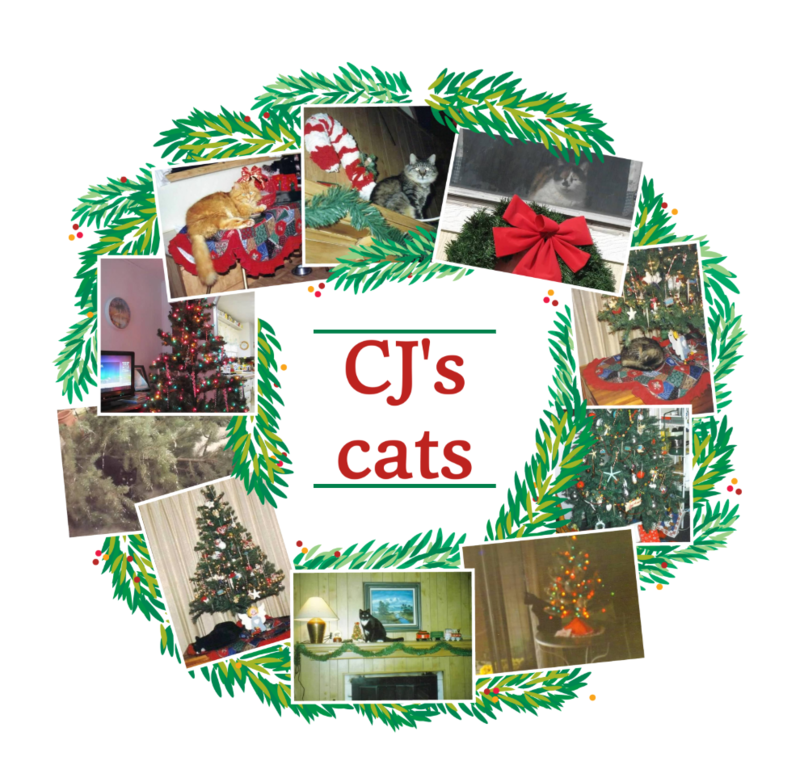 Recently, she shared the Christmas photos that she’s taken of the cute kitties. I just had to share them as I know there are plenty of cat lovers reading this blog. Over time, many cats enjoyed napping under Carol’s holiday tree. She decorated it with ornaments she collected and even with a seashore theme when she lived in Seadrift, Texas. 2016, tree down! Graycie managed to bring it down, on top of Fraidy in the recliner. The heavy part missed him, just lots of branches, so he was only startled. Here’s an update from Carol with a 2018 Christmas photo, “I spotted Bits sweetly posed by the Christmas music video I’d found on the TV! Just about ready for Christmas dinner with family in Andover. Yesterday, for my contribution, I got all the cranberries, apples and nuts chopped with Lola’s delightful little chopper, stirred them together with crushed pineapple, mini marshmallows, and in the fridge to chill. This morning folded in the thawed cool whip, then back in the fridge to stay chilled. Just now, put the Krusteaz buttermilk cornbread in the oven. Carol’s cat kindly posed by the Christmas scene on the television. I took Mom’s book, My Flint Hills Childhood, with me to the Christmas luncheon my writing group had. After we munched happily on quiche, little sandwiches, salad, and assorted yummy desserts, we started sharing Christmas stories from our younger days. In particular, she remembered saving the string from feed sacks and rolling it into a ball to save. Then she remembered using that string to thread popcorn on for garlanding the Christmas tree. It also came back to her about her father going out to cut down a tree for their holiday. 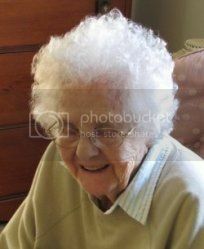 These memories of my 82-year-old friend and fellow writer paralleled the experiences of my mother who was born in 1924. Even though one lived in Kansas and one in South Carolina, they shared similar Christmas customs back in those simpler times. It was a special moment. I wrote this post on my personal blog twelve years ago. Now, it is December 8th again and still, we mourn the loss of someone who was so important to the fabric of our family. Two years ago on December 8, 2006, my youngest sister died unexpectedly at age 49. Shannon Hyle was a special person, not just to her immediate family, but to all who knew her. The church overflowed with bereft people on the day of her funeral. Now it is two years later and our lives adjust to going on without Shannon. It comforts us to think she can peer down and approve the progress we’ve made through our grief. I’m sure she’s thrilled that her daughter, Diana, finished graduate school and is working as a librarian. She’s equally thrilled to see her youngest, Samantha, succeeding in her second job and that she’s found a loving man to share her life with. My album of photos of Shannon. You can see Shannon’s own writings on the Our Echo site. I particularly love her essays on books she loved, “Falling in Love among the Bookshelves,” “Life Without Georgette,” and “My Bookshelves.” We found one of her writings after her death and posted it for her, Memories from Shannon. Shannon loved using stamps to make delightful cards. I found her cards that she posted on the SplitCoastStampers gallery online. Use the search function and put in vcm3007 (Shannon’s username for the site). She posted some of her paper bag scrapbooks there too. She has 142 pages at the site with about 12 cards per page. Art created by Shannon Hyle. I created a tribute webpage for Shannon on Hubpages with more photos and memories. If you have memories of Shannon that you’d like to share, please leave a comment or you can post them on the Our Echo website for Shannon’s friends and family to see. The Christmas I remember most happened in 1958. Clyde had been released from the hospital in September, after a five-month stay, as the result of a car accident. He was getting around slowly on crutches but couldn’t go back to work yet. This photo actually shows Clyde Martin in 1959 in his father-in-law’s workshop, but we don’t have a 1958 photo of him. We had six children, the youngest only six months old, who was born while Clyde was in the hospital, and no paycheck, so Christmas looked bleak. I was unable to even make the kids any homemade gifts because I was so busy keeping five children clean, fed and in school, and caring for the new baby. My husband helped all he could, but he had trouble getting around so he kept busy in the garage restoring old bicycles. fee to him for them. My husband would spend hours either leaning on his crutches or perched on a tall stool and work on the bikes. In the process, he would scrape off all the old paint and sand the metal bare, before starting to rebuild a bike. He redid several and was able to sell them for enough to buy new tires, tubes, seats and handlebar grips. By Christmas day he had a beautiful bicycle restored for each of our children, except of course the baby. They were all painted just like the new ones in the store windows. Even pinstriped. With five new bikes on the block, it was a good thing we lived next door to the school yard. You can read more of Gail’s stories on the Our Echo website. Here’s some nostalgic reading for you for the month of December. Some pieces are written by Gail Lee Martin, and some are memories written by her daughters or sister. The ABCs make a countdown to the 25 days of Christmas. You can read a different story each day of the holiday month. As I unwrap the tissue around the first piece, I savor the moment of rediscovery. Here’s the reindeer my mother made of wooden clothespins. Its hand-drawn face always makes me smile. The next ornament, an old lead crystal pendant from a long-ago chandelier, was a flea market find. I love the way it gleams when the tree lights touch it. I sit beside a stack of boxes containing my Christmas treasures. I’ll have hours of quiet pleasure taking the items out one-by-one and placing them on the holiday tree. Some people feel it’s a chore decorating the tree and house for Christmas. Now that I’m retired, I no longer have to rush through the process or squeeze it in between work and other commitments. Having time to luxuriate in memories makes the tree decorating a special time just for me. Each piece evokes a memory of a special person or time in my life. Here are the folded German stars that my friend, Jaye, made for me when she lived on an island in the Casco Bay. I know that further down in the boxes I’ll find the angel she cut from heavy paper. I also love the sprightly elf she made from a pine cone and an acorn with a red scarf tied around its neck. I pull the tissue away gently revealing one of my Australian finds. It’s a pottery silhouette of a kangaroo that reminds me of three years lived in Alice Springs. There’s another kangaroo lurking in here somewhere. It’s made of felt with a sprig of holly adding a holiday touch. I remember the Australians calling the holiday chrissy. They shortened so many words that way. Where is the koala? Oh, here it is. Next, I reveal a glass star that I hang where it can twirl freely and catch the light. Then a glass icicle emerges. It’s a substitute for the plastic ones we had when I was little. The plastic ones glowed in the dark and when we became impatient waiting for night-time, we took them into a closet to see their purplish glow. Here’s one of the many cat ornaments. This black and white one looks just like my Silly Kitten who lived with me in Ohio and Maryland. I named her for a favorite storybook, The Three Silly Kittens. The grey cat made of clay grins guiltily while holding a tiny ornament in his paw. That was Ashley who was always into mischief. I miss having a cat now that we travel so much. For now, I can remember all the great cats in my life when I see the clay and cloth and glass cat ornaments dangling from my tree. I don’t miss the way Ashley could un-decorate the tree almost as fast as I decorated it. There are so many animals on the tree, including a white tin rabbit representing my years of rabbit raising in 4-H. The felt sheep reminds me of traveling in New Zealand and Scotland. The cardinals bring memories of my grandparents who introduced us to bird watching. This tiny deer made of shrink art plastic takes me back to craft projects at home. Mom introduced us to coloring and cutting and heating the plastic shapes. I should make more of those. I still have some of the plastic for it even though it is thirty years later. The next box contains seashells. Each hangs by a thin gold cord and a sprinkle of glitter enhances the natural shapes. I purchased those last year to remind me of my library in South Texas. The last year that I was the director there, they decorated the tree with seashells like these. The seashells also remind me of our trips to coastal areas like the Great Barrier Reef and South Padre Island. Here’s the box of cloth ornaments. It must be the librarian in me that categorizes the ornaments by type when I box them each January. I have lots of quilt designs to hang on the tree. Many are fabric, but some are brass. I’ve always loved old quilts and my grandmother made one for me when I married. These ornaments also relate to my years in the Baltimore Heritage Quilt Guild. I wrote their newsletter for several years, then organized the quilt show and finally served as president of the guild. I find the crocheted snowflakes. They add a lacy touch of white to the dark green tree. Here are the snowflakes that Mom made from ribbons. Next, I unwrap the pleated Victorian fans that I made from wide ribbons edged in lace. My tree certainly is eclectic. At last, I open the individual boxes with two 1940s ornaments. My mother had some like these and she cried when I broke one. It had belonged to her mother. I hang the fragile ornament at eye level on the tree. It’s older than I am. An ornament from the 1940s or 1950s. Next, I add the sports ornaments that I found to match my husband’s interests. There’s a glass replica of a basketball, baseball and a football. The golf ball represents our three days a week on the golf course. Then I add our newest ornaments that represent our times in Maine and New Hampshire. That includes a moose made of birch bark. My tree gets more and more crowded as the years pass. I can’t give anything up. Each has a special meaning to me. This year we found a bigger tree and I put a three-foot tree in the dining room as well. That one is totally decorated with tiny baskets. After taking basket making classes in the 1980s, I can’t resist a little one whenever I see it, now that I know how hard they are to make. It isn’t finished, but I don’t mind returning tomorrow to the task. I don’t want to rush through the tree trimming. Placing each ornament takes time to find the best spot on the tree for that memory. Days later I’ll often move a few about to balance the tree or for better viewing. Memories are meant to be savored and for the month of December, these ornaments trigger many memories of people and places in my life.